So. Picture the scene if you would. I’m sitting in Bugman’s Bar. It’s mid-morning and I started the day with a bacon roll. Which was very tasty. I’ve had a conversation with my editor about stuff that’s already been written and about stuff that’s going to be written. He goes off for a meeting, with a view to having another one with me at 2pm. Not So Small Son and Dearly Beloved are out in the gaming hall, where DB is crushing the orks under the righteous boot of the Imperium. I’m sat with a cup of coffee, my laptop and Valkia the Bloody. All is well with the world. Editor re-appears from the Super Sekrit Door that leads to the mysterious depths of BL Towers. ‘Thought you might like this,’ he says. And puts this in my hand. Yep. That’s it. The Gildar Rift. My first novel finally printed and in a physical, tangible form. For the last few months, it’s been digital. Digital text, digital images, digital four-page-colour insert. All great fun, but not really real. This however, is a book. It looks like a book. Riffling its pages releases that wonderful New Book smell. It has the dedication in it. And above everything else, more than the story, more than the cover art, this was the thing that did it. This was the moment that put tears in my eyes. I went straight to it. For my mum, who always told me I could, but never got to say ‘I told you so’, and to my dad – for everything. NSSS and DB were still out in the gaming hall and the editor-beast sloped back to the office. I’m not ashamed to admit that it was a hugely emotional moment for me. I rang my dad. I wanted my daddy. I read him the dedication and he got all emotional too – but in an entirely good way. He said he was proud of me. And that released a fresh new wave of Awesome. Today was a magical day. And there are so many people who supported me this far… too many to name, but I just want to give a shout out to a few specific people. Lee, RayeRaye and Jefficles. Without whom I would have given up halfway through chapter four. The Combined Super-Might of Graham McNeill, Aaron Dembski-Bowden, Dan Abnett and James Swallow. Without whom I would never have even had the nerve to do *anything*. By their powers combined, they were infinite wells of support and knowledge. The Editor-beast. For dealing with my tantrums. NSSS and DB. Who know. The Tuesday Night Group. Who must hate me, but never said anything. I am proud beyond reason. And more than anything, the fact I’m 3/4 way through writing Valkia tells me that it won’t be the last time I feel this way. This entry was posted in Writing and tagged Black Library, Gildar Rift, I'm an author now, W40K, Writing. True congratulations are in order, Ms. C. I am truly happy for you, and for your upcoming successes. Yes! Get published. Chop, chop! Congratulations! That’s a fine cover, and a lovely dedication. You go, girl! Seeing it existing within a human hand makes it seem so much less impressive. I don’t know what I was expecting, something with more fire. Can you get them to make your future books out of fire? I don’t want to be disapointed again. It would be very cool, I admit. Actually, it’d be hot, not cool, but you get my meaning. Congratulations, Sarah! Lovely post. One of those moments in life that you never, ever forget and well celebrated too. Thank you very much. 🙂 I suspect I will be on a euphoric high for a few more hours yet! Can’t wait to pick up a copy at Games Day, have you sign it, and then read it myself! Congratulations, chuckie egg – it’s a masterpiece, and you’re a star. Bravo! 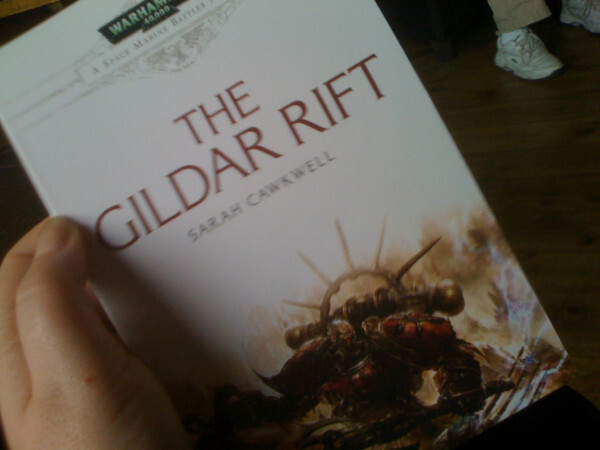 Be glad to make Gildar Rift my actually first purchased Space Marine Battle novel as a self pre-Birthday gift. 😛 Now why don’t you start cranking out more novels and maybe you’ll join BL’s “Big Kids *.*. Table”, eh? Great news. Congrats. I’m still catching up on the blog, but I pre-ordered a few days ago. Looking forward to it. A physical book in your hand still beats a Kindle file, doesn’t it? DJW – not for me. I actually get on better with the Kindle than I do with the book. It’s horses for courses.